At home in the finest speakeasy or jazz club of the 1920s. Beautifully proportioned with an elegantly rounded handle and top. Features intricate beaded trim around the cap and spout. 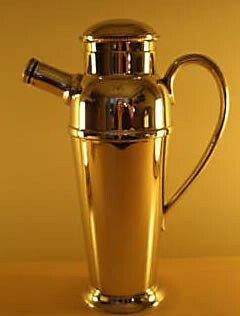 Celebrate the elegance of the 1920s with this limited edition cocktail shaker. Classic Shakers are crafted by hand in the U.S.A. Engraving available. Copyright © 2006 Classic Shaker Co.